This post is focused on installing SQL Server 2008 on a Windows 2008 R2 server for those of only need to do a few installs. In other words, this is the quick fix. At the bottom of this post is the solution for how to resolve this issue if you regularly install SQL Server in this configuration. In other words, at the bottom is the enterprise solution. For me, I ran into this issue building a virtual machine for local testing of SharePoint. If you continue the install process, you will get through all the setup screens but the installation of any of the services will fail. The issue is the setup files that come with the RTM version of SQL2K8 cannot properly install the services on the R2 version of Windows 2008. Anything I did from this point forward did not resolve the issue. I did some research and found the answer. I started with a clean Windows 2008 R2 image and started my resolution process from there. So here is the work around solution. Before you even try to install SQL2K8, run the SQL2K8 Service Pack 1 install. As it starts up, it will install the latest group of setup support files. After this part is done, it will not detect any installed SQL components (to be expected) and you will cancel the installation. Now run the installation of SQL2K8 just like you always would. The installation will detect that there are newer versions of the setup files installed already and will use them instead. These SP1 setup files are aware of Windows 2008 R2 and your installation will complete successfully. 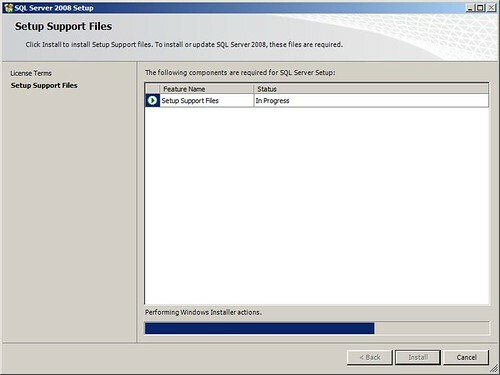 Remember to go back and re-run the SQL2K8 Service Pack 1 to actually update the installed services on your system now. That is it! You are done! Enterprise Solution: If you are regularly installing SQL2K8, this solution is very much a work around and adds extra steps and time. The solution for when doing several installs is to make a SQL Server 2008 SP1 slipstream install location. With this solution, you will be able to run the install once, have it install without errors, have the server configured and have the service pack already installed. This entry was posted in Microsoft SQL Server, Microsoft Windows Server, SQL Server 2008, Windows Server 2008 R2 and tagged Tips. Bookmark the permalink. awesome finding! that fixed my problem. Thanks. Thanks very much, I was looking for this solution for a while. Many thanks indeed for this tip – saved me hours! Seems to be quite crazy to pay so much for programs that cannot even be installed without problems! Great Post — worked like a charm. One thing that happened for me was that during the install it asked for some files from the extracted SP1. I simply expanded and pointed to those and it worked great. you have access to that directory. installed SP1 first, worked like a charm. Do this workaround also works with SQL Server 2008 SP2 support files? I haven’t tested it but it should it. Since the fix was introduced in Service Pack 1 and the install process works the same for Service Pack 2, the workaround solution should work fine with Service Pack 2. After trying to install first SP1 my SQL 2008 R2 did’nt give me the error “Error reading from file xtfugnej.dll. ” anymore! thnx! Absolutely would not work for me. After many,many repeated tries still get the “known incompatibiliies” message. You will continue to get the incompatibilities message. However, this should allow it to install successfully in the cases I have seen. Because I do not install SQL Server 2008, no any Feature in combox, and can’t make any selection. Does anyone meet this situation? Larry…that is correct. But because you went through the installation to that screen, newer setup files were deployed to your system. You cancel out of the SP1 install when you get to the point where you can’t select anything and then you go back and install SQL normally. What to do when you already have SQL 2008 running on W2K8 R2 without SP1? So SQL 2008 is supported on Windows 2008 R2 once you get to Service Pack 1 or higher. So I would recommend upgrading to Service Pack 3 for SQL Server 2008 since it is the latest service pack. Also, the only versions of SQL Server 2008 currently supported by Microsoft are SQL 2008 Service Pack 2 or higher. Microsoft only supports their server software at the current service pack or the previous service pack (for up to 12 months after the latest service pack is released). So either way, currently you aren’t on a supported version of SQL Server 2008. I have been trying to install SQL 2008 on a Windows 2008 R2 standard server (with SP1) and I get a “incorrect operating system error in the install. I have gone through the documentation for all versions of SQL 2008 and my version of Windows is listed as correct for all SQL versions. Does anyone have any idea what to do next? The OS passes during the initial startup of the install for SQL – but after I add the users and the location for files – the setup runs another check of the OS and that is where it fails. I’m about installing SQL Server 2008 R2 on Windows 2008 R2 Server Standard Edition. Fortunately, I came across this article before I start. Thank you! As much as I wanted this to work for me, it did not. I am at my wits end at this point and I’m just going to build a new machine with a compatible OS. It did not worked for me so i tried following http://insomniacgeek.com/pre-requisites-for-installing-of-sql-server-2008-on-windows-server-2008-r2/ before successful installation. I want to install sql server 2008 r2 but when I run it to install its setup can not run what’s the solution? I would need to know the exact error message to help. Thanks a lot, good job. You sir made my day .. Thanks a lot .. I have been trying to install SQL Server 2008 R2 on Windows Server 2008 system since I have a 32-bit server system and that’s the only latest server operating system that I could go for and still be able to install sql server 2008 r2 .. After I started receiving this error message “Unable to load one or more requested types. Retrieve loaderexceptions property for more information” .. I’ve been killing myself with the google search trying every other alternative .. The error message is really not helpful .. Took your suggestion .. Worked like a charm .. Thanks again !!! I try to Update from SQL2008 to SQL2008 R2 on a 2K8R2 System an becam the following Error. Fehler beim SQL Server 2008 R2 Setup. Do anyone know what to do ? I try to first installed mysql server 2008 sp1 and after I installed mysql server 2008, the program compatibility assistant does not appeared in my screen and continue installing, but it’s not install completely in my computer. what can I do? I have been trying to install SQL SERVER 2008 R2 on my laptop with window XP. Just right before the installation to be completed, I am getting an error message “you dont have a valid login”. If someone have the fix, please share. I came across with the similar issue and finally was able to install SQL Server 2008 R2 Enterprise 64-bit edition on Windows 2008 R2 Enterprise Edition x64 OS. I would like to inform you all that the stubborn installation had been completed successfully using edition upgrade approach. Initially, I installed MS SQL Server 2008 R2 Developers Edition(64-bit) on Windows Server 2008 R2 X64 server and later upgraded to Enterprise edition of SQL Server 2008 R2(64-bit), and it worked for me. I am getting the below error while installing SQL server 2008r2 enterprise on windows server 2008 r2. The specified local group does not exist. Click ‘Retry’ to retry the failed action, or click ‘Cancel’ to cancel this action and continue setup.